February, 2019, Taipei – Advantech (2395.TW), a global leader in intelligent systems integration, today announced that a series of Advantech’s industrial computing devices support the latest version of Windows 10: Windows 10 IoT Enterprise 2019 RedStone 5 (version 1809). Advantech provides integration services for their hardware and systems by building OS images with built-in drivers. Besides standard OS functions, Advantech also offer embedded customized OS images. Windows 10 IoT Enterprise is a full version of Windows 10 that delivers enterprise manageability and security to IoT solutions. The new release Redstone 5 (RS5) offers not only more stable functionality but also 10 years support which helps industrial OEMs to extend their product lifecycle support. Starting from RS5, Windows 10 IoT Enterprise offers both Long-term Servicing Channel (LTSC) and Semi-Annual Channel (SAC) options for OEMs to choose for their devices. Windows 10 IoT Enterprise is well known as the OS of choice for industrial computing devices worldwide. Along with AI and machine learning trends, device applications are required to be smarter and more refined. Therefore, Microsoft offers Windows 10 IoT Enterprise 2019 with Azure support and wide hardware choices, making IoT devices more intelligent and suitable for various fields by moving computing power and cloud services from cloud to the edge. Security is always highly valued by Microsoft, so RS5 offers Device Health Attestation (DHA) for automate security health checks and Windows Defender Advanced Threat Protection (ATP) for preventative protection and detection of attacks. With these latest security features, devices can be secured from the edge all the way to cloud. Windows 10 IoT Enterprise offers consistent and predictable device lockdown across all form factors. However, developers may need to dig deep to figure out where to configure their lockdown settings. 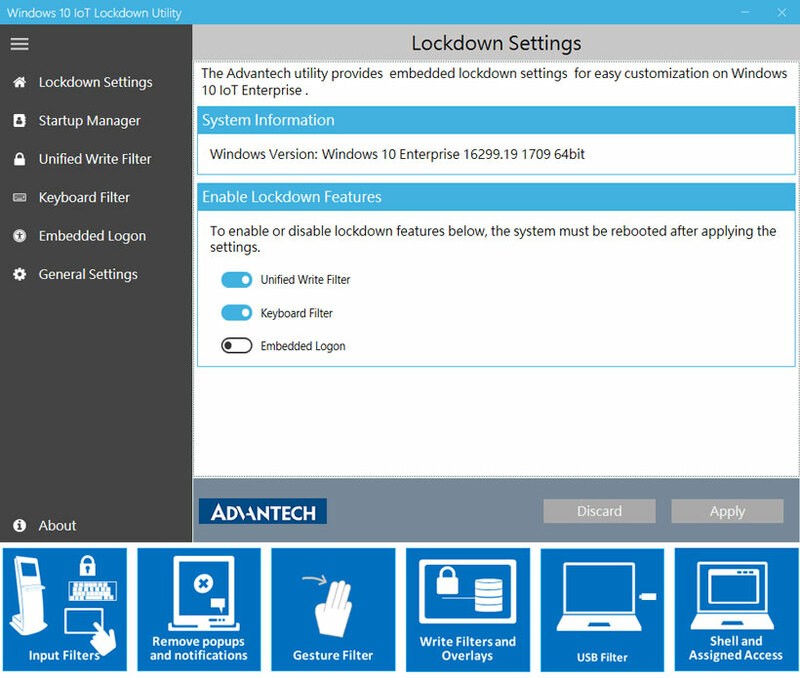 So Advantech offers a Windows 10 lockdown utility with user-friendly UI that guides the user to use toggles to enable/disable components easily. With this utility, users experience an extra layer of security and can protect their devices through a single click. To fulfill a variety of application requirements, Windows 10 IoT Enterprise RS5 offers developers an easier tool set and environment that helps expedite development, and lightens the process with great App compatibility and visual studio support. RS5 also supports connection to different protocols (OPC-UA/Industry std protocols) and sensors (location, heart-beat, finger prints etc). Together with Azure IoT, RS5 allows IoT devices to be utilized everywhere and built faster. Benefitting from a strong Windows ecosystem built up from chipset vendors and hardware providers, manufacturing partners can quickly and easily deploy the new OS into their devices.